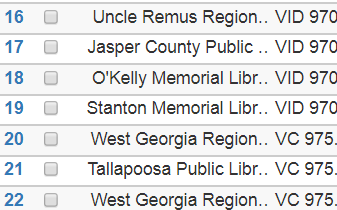 In the Holdings View of the OPAC in the web client, the full names of the library (currently "Full System Name ... Full Branch Name" become truncated to the point of non-usability if enough columns are displayed. A preferred solution to this according to an informal consensus in IRC is to use the short (policy) names of the libraries/branches instead (see http://irc.evergreen-ils.org/evergreen/2017-12-01#i_336142 for discussion). It looks good, but I'm coming across one strange problem. When I first retrieve a record and then click the Holdings View tab, on the first try, I either get no org units listed or I get a limited number of holdings listed. If I click OPAC view again and then click back into Holdings View, all holdings display as expected. I don't see the same behavior on a clean master system. Since this change will primarily affect catalogers, I'll throw out a message to the cataloging list to bring attention to this bug to verify that they see this change as an improvement. On further investigation into the previously-reported issue, I think I was seeing a pre-existing bug related to the "Show empty volumes", "Show copy detail" and "Show volume detail" checkboxes. I'll file those issues in another bug if it hasn't already been filed.